The New Patriotic Party (NPP) agent who recently revealed how he and others have been trained by Lord Commey and others in ways to commit electoral fraud, Owusu Achimpim, has made available to The Lens some of the evidence of his dealings. Days after The Lens published his revelations, Owusu Achimpim, a.k.a. Kwadwo O. Achempim, called The Lens' undercover investigator and complained that since the publication he has come under severe attack from other members of the 'Fully Trained Vigilant New Patriotic Party Agents' such that he feels he is no longer trusted in the NPP. "As for me, now that they have made it clear to me that they no longer trust me, I am going to make the evidence available to you. They can't touch me, I know too much for them to dare touch me. If they dare I would expose them on a much larger scale," Achimpim fumed in vernacular. "These that I am giving you represents just a tip of the iceberg, and the National Youth Organiser of the NPP, Mustapha Hammed, the National Organiser of the NPP, Lord Commey, Jake Obetsebi-Lamptey, and the others know what I know," he insists. We reproduce the original news story headlined 'NPP'S MULTIPLE REGISTRATION GALORE - AGENT REVEALS ALL', which was published in issue No. 38 dated ...... The Lens can today reveal that the New Patriotic Party (NPP) used its so-called 'Fully Trained Vigilant New Patriotic Party Agents' to indulge in multiple registration during the recent registration exercise Evidence available points to the fact that the NPP's so-called 'Fully Trained Vigilant New Patriotic Party Agents' are nothing but a collection of individuals trained to indulge in all manner of electoral fraud. One of these Agents, Owusu Achimpim, also known as Kwadwo O. Achempem, indulged in multiple registration during the recent registration exercise, and felt bold enough to go around bragging about his exploits. Achimpim registered on 16th March 2004 at registration centre No. 20125049 (HI) with the name Owusu Achimpim. On 17th March 2004 he again registered at registration centre No. 18096323 (II) with the same name. 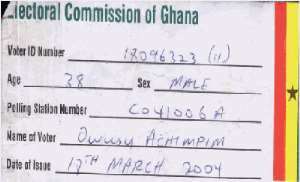 That same 17th March 2004 Achimpim registered again at registration centre No. 18096211 (DG) with the name Kwabena Nyanor. Speaking to a Lens undercover investigator, Owusu bragged that he and other members of the so-called 'Fully Trained Vigilant New Patriotic Party Agents' were trained "in the art of multiple registration" by party officials, including National Youth Organiser of the NPP, Mustapha Hammed and the National Organiser of the NPP, Lord Commey, to indulge in multiple registration and multiple voting. He revealed that the NPP awarded him, as well as other members of the so-called 'Fully Trained Vigilant New Patriotic Party Agents' "certificates of honour" signed by Jake Obetsebi-Lamptey and Odoi Sykes, for their roles in ensuring victory for the NPP, including multiple voting. Achimpim revealed to our investigator that during the 2000 elections he voted countless number of times using different photo voter identity cards bearing his picture. And to prove his point, Achimpim showed our investigator two different photo voter identification cards bearing his names and pictures but with different polling centre code numbers and different ages. "Look, the NPP is not like the NDC. As for the NDC they don't know how to hide their true colours, but the NPP, we know when to pretend that we don't like something when all along that is what we like. People don't know, most of the things that we were accusing the NDC of, we were doing them on a larger scale. You see, our loud protestations were only meant to divert attention from us to the NDC so that we would have a free hand in manipulating the process, and we succeeded. The NDC has no idea how we rigged the 2000 elections to enable us win. Let me tell you, we will win again through those same means," Achimpim revealed in vernacular.